BMT has completed a project for Heerema Marine Contractors (HMC) providing marine simulation studies which have supported the installation of Shell’s Appomattox Floating Production System. The topside and hull of Appomattox, Shell's largest floating platform in the Gulf of Mexico, were integrated at Kiewit Offshore Services (KOS), Ingleside, Texas prior to installation. The completed platform was then wet-towed from the KOS integration yard to the installation site. To facilitate this operation, BMT delivered a multi-user training simulator to enable HMC to investigate towage operation obstacles and manoeuvring characteristics of the hull during the inshore part of the tow, covering La Quinta, Corpus Christi Ship Channel and Aransas Pass. These studies played an integral role in identifying overall obstacles during the towage operation and developing operating strategies. Furthermore, the studies helped to determine rational weather and tidal operating limits and provide training and familiarisation for the towmasters, tug captains, pilots and other marine personnel who were involved in the tow. BMT further developed a hydraulic simulation of the tidal and non-tidal current flow through the Corpus Christi channels which provided a time series of the currents likely to be encountered during the tow. The final phase was delivery of the training simulator suite to the customer’s site in Texas and to construct simulation models of the tow using BMT’s industry-leading navigation simulator, REMBRANDT which incorporated the tow handling and environmental models developed in the preceding stages. 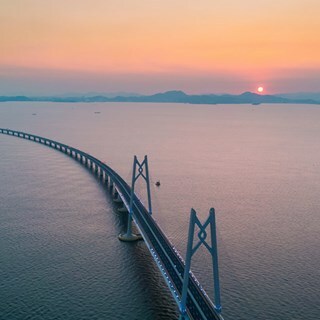 Spanning 55km, the Hong Kong-Zhuhai-Macau Bridge is the world’s longest sea bridge and one of the region’s defining landmarks. BMT helped to address planning and marine traffic issues during the construction phase.